What exactly is my field of expertise? "What exactly is your field of expertise?" I am an entomologist. One might wonder what bugs have in common with hoplites, but I work in a field called Self-Organization. We study how large groups of individuals (ants, termites, and people) come together and produce specific outcomes without the need for specific top-down planning. In social insects, this includes things like building huge nests and digging extensive tunnel galleries (my specialty), but in humans this encompasses the behavior of large crowds and the self-organization of traffic patterns. It is the confluence of a chance of birth, my great-grandfather was actually from Sparta, and the fact that in war, and especially in a mass formation like a phalanx that we see humans acting in the most self-organized way that brought me to this. You might say "war? self-organized? but what of all those officers?" I would counter with the fact that no officer in the history of warfare ever ordered his men to rout and run for their lives, and yet they do so in a highly coordinated manner. This same under-layer of self-organization exists during an advance and in group fighters like hoplites, during battle. Over the last decade I have been studying hoplite battle. Initially I simply bought the prevailing notions of V.D. Hanson and those on his side of the squabble over hoplite combat, seeing challenges such as those by Van Wees as unfounded. But somewhere along the way I realized that the mechanics they propose for hoplites pushing each other are simplistic. They are based on an extrapolation of what would work best for two individuals colliding and do not produce the maximum force when men push in ranks. From that realization spawned all of the information on my blog. I have attempted to show the most efficient manner of pushing in mass- if hoplites pushed during battle. I write that disclaimer because some level of pushing is my base assumption, and in earlier posts I have shown the features of the aspis that support this notion. If they never pushed in files, then all of this is irrelevant. The end product of my research is that I can reconcile the two divergent views on hoplite combat. Hanson was not wrong in principle, just unclear on the mechanics. I don’t fault him for it, that knowledge was beyond his expertise, but his presentation was vulnerable to those who wrote against pushing because I believe many intuitively knew something did not work, and some evidence, like spear fighting before pushing, could not be accounted for sufficiently. But for the fact that the “heretics” did not believe in a push by files, they had many features correct. In a sense it is like the heretics had much of the early phase of battle correct, while the orthodoxy understood the end of battle- or at least of many battles. 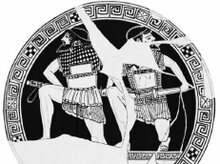 Obviously there are not all that many of us interested in hoplites, but I would love to see more people with divergent training put that knowledge to use in the study of hoplites. By the way, Self-Organization has caught the interest of modern armies. Google it and you’ll find many resources. If you do a Google scholar search on me (Bardunias), you’ll see what I normally publish about insects and how they work in groups.